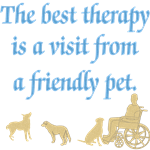 An animal visit can offer entertainment, or a welcome distraction from pain and infirmity. People often talk to the dogs, and share with them their thoughts and feelings and memories. Animal visits provide something to look forward to. Stroking a dog or cat can reduce a person's blood pressure. Petting encourages use of hands and arms, stretching and turning.. These products promote the wonderful value of the visiting pet. The Dog-Play Therapy pages offer more information about the various kinds of programs where animals provide a healing force. Here you can find bumper stickers, buttons and T-shirts to help promote this wonderful activity.